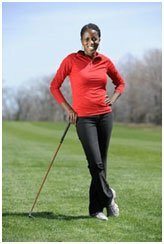 Jamie Taylor, a Cleveland Metroparks LPGA golf pro, is teaming up with ERC to provide female golfers some insight on leveraging business (and fun!) out on the golf course this summer. "Golf etiquette imitates business etiquette. Knowing basic golf etiquette will help you impress any potential business partner." Jamie explains that on the golf course, players must practice patience, be courteous, and attentive. Since there are no referees in golf, players are expected to call penalties on themselves. A golfer shows integrity by calling a penalty when they are in the wrong - also a critical business skill. Jamie comments that by the time your round of golf is complete, you will know your fellow players well enough to make an educated business decision. "Use opportune moments, such as lag time in-between tees or time traveling to your ball, as a chance to get to know your golfing partner." The importance of practicing good golf etiquette cannot be overstated. Jamie believes that learning and practicing these rules can help make you a more enjoyable person to play with, and a more successful business golfer. She notes that while it is helpful to be decent at the game, the most vital part of golfing for business is etiquette. By knowing the basic rules of when to talk and where to stand, you will make the game much more enjoyable (and productive!) for all players involved. Jamie also recommends taking some golf lessons. She states that lessons are critical, since golf is not an easy game to teach yourself. "You want to know what you're doing when you play with customers and clients. By mastering some of the basic golf techniques, your golfing partner will know that you take the game seriously and therefore, take the business meeting seriously, too." Take lessons before you play on the course. Get a club-fitting before purchasing any golf clubs. Start golfing at Par 3 courses or the most forward golf tees. Always show up 30 minutes prior to your tee time. Make sure to call the course ahead of time for dress code rules.